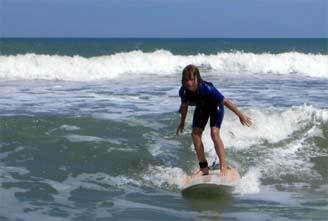 Learn how to surf in Cocoa Beach, Florida! 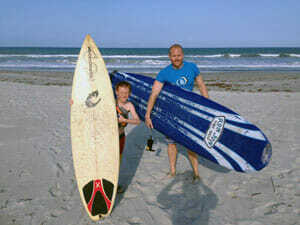 SoBe Surf provides premium private surf lessons with lifeguard instructors. Enjoy the personal professional attention with just you or your private group in the surfing lesson. You will meet your Instructor at our Merritt Island Shop to check in (just 3 miles from the ocean), then follow your instructor to the appropriate beach for the lesson (determined by the surf conditions that day). All you need to bring is swimsuit and sunscreen. If you’re looking for a more private surf school experience, book a preferred time online or give us a call for any question at (321) 926-6571! We always answer the phone during daytime hours. Sobe Surf is not the typical surf school. We give you great equipment, personal service, and expert instruction from local lifeguard surfers for your private surf lessons. Our surfing lessons typically consist of a 2-hour session in which you’ll learn surf etiquette, how to paddle the board, how to choose the right wave, and how to pop up to your feet and ride. It’s an exhilerating experience and super fun! Lesson price includes all all equipment and lifeguard instructor. Book online then meet at Sobe Surf at 635 S. Plumosa Street and we’ll get started from there! See the table below for lesson rates. Discounts are provided for multiple lessons and/or large groups. Lessons include instructor and all equipment. loaner wet suits are available during winter months upon request. Book online or Call us if you have any questions! * Call for large group rates. We’ll be glad to accommodate you and will come to your location! Scheduling a surfing lessons is easy and you can book online through our website. If you’d prefer, you can also call us at (321) 926-6571. Either way, we’ll be glad to get you started! 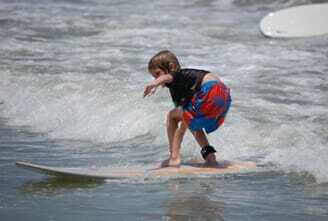 SoBe Surf’s Cocoa Beach Area Watersport Center is located on Merritt Island at 635 S. Plumosa Street. Have a look at the map below for directions. We look forward to seeing you here and having a great time in the water! If you have any trouble finding us at our Cocoa Beach location, just give us a call at (321) 926-6571 and we’ll be glad to help you out! Ask about discounts for families, large groups, teams, military, and locals. We’ll be glad to help you out! If surf lessons aren’t exactly your thing, check out these other things that we offer! Call us at (321) 926-6571 or send us an e-mail to get further information on lessons, rentals and tours in Cocoa Beach and Miami.